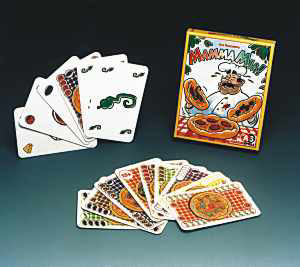 A light and fun memory game that is often requested on game night. Add ingredients to the discard to make a pizza and then get it into the oven before someone else does, using your ingredients! The first to finish making all of their pizzas is the winner. Goods for kids and adults. Making a pizza! Fun and fast paced card game. Great game if you like bohanza you will like this one too! Fun, all-ages filler. Memory doesn't have to be perfect--you can do a little planning. Also, how you fill your orders can let you hose over the other players. Nice little game, might join the "filler of choice" rotation.